Exercise Works! was formed in 2011. A key vision for the organisation is to enable all health care professionals to provide safe and effective exercise advice to patients and the public. Ann Gates MRPharms is the founder and CEO, and is a key-note speaker, presenter, author, blogger, and disruptive innovator for physical activity advocacy and influence! John Gates MCSP is also a Director of Exercise Works and a physiotherapist within a UK hospital. He joined the company in 2016. 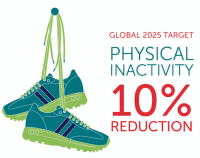 In 2014, as part of Ann's role as an Emerging Leader for the World Heart Federation, she was asked what she could do to help lead and deliver on the WHO "25x25" goals*, and especially the 2025 WHO aim to reduce physical inactivity by 10% by 2025. On one side of a page, a three year project plan was drawn up. Phase 1: to provide an educational resource on exercise medicine and chronic diseases for undergraduate medical students in the UK. This project was successfully completed in 2014, with over 15 of the UK medical schools using and potentially examining on the resources. Glasgow Medical School became the first medical school, in 2016, to exam final year students on physical activity guidelines and patient care. Phase 2: to develop the resources for all undergraduate, student: doctors, nurses, midwives, dentists, pharmacists, social workers and all allied health care professionals. In 2015, over 450+ downloads of the resources had been made by national and international schools of medicine and health. The resources were also evaluated by The University of Nottingham, using a team of over 29 international evaluators and physical activity experts. The evaluation scored the overall resources as 8/10 for quality. The evaluators consisted of physical activity experts, exercise medicine professionals, exercise physiologists, health care professionals with a special interest in chronic diseases, and educationalists.The resources were endorsed for undergraduate use by The Council of Deans of Health, UK. Phase 3: to enable all health care professionals, specifically physiotherapists, and community health/charity workers, especially in low and middle income countries, to access and use the resources to build capacity to deliver change within their own practice, communities, nations and internationally. This final phase of the plan covers 2016-2017. Exercise Works has partnered with Physiopedia to deliver on this important phase of the project. The ‘Exercise Works’ Resource Set is a collection of evidence-based slide sets for teaching the benefits of physical exercise in 21 different areas of healthcare, including cancer, stroke, heart disease, mental health and post-surgical recovery. Nearly 30 authors**, all passionate and experienced in exercise prescription and chronic diseases, pregnancy, and surgery, developed the educational content. On completion of the course learning and activities, participants will be in a good position to lead and effect change on physical activity within their own practice. It is hoped that the course participants will become the next generation of "physical activity champions" and advocate and exert influence in all aspects of physical activity, exercise and physiotherapy opportunities. Exercise Works! continues to promote and advocate for physical activity education and influence! Follow @exerciseworks for the leading research, practice and influence on "a movement for movement". Many thanks, Ann Gates, Exercise Works! *Noncommunicable diseases (NCDs), or chronic diseases, account for 36 million deaths annually. The four main types of NCDs are cardiovascular diseases (CVDs), cancers, chronic respiratory diseases (such as chronic obstructed pulmonary disease and asthma) and diabetes. Nearly 80 per cent of NCD deaths - 29 million - occur in low and middle-income countries. CVD accounts for the majority of NCD deaths, 17.3 million people annually, followed by cancers (7.6 million), respiratory diseases (4.2 million), and diabetes (1.3 million). CVD is projected to remain the single leading cause of death worldwide and, by 2030, will be responsible for 23.6 million deaths each year. Yet, 80 per cent of premature heart disease and stroke is preventable. Increase the political prioritisation of NCDs. Recognise the impact of NCDs as not just a health issue, but also as a major economic burden and obstacle to global health. The outcome of the meeting was a Political Declaration signed by all the UN Member States that now represents the NCD roadmap. The first action step of the Declaration came in May 2012 when the World Health Assembly (WHA) adopted a global target of a 25 per cent relative reduction in overall mortality from cardiovascular disease, cancer, diabetes or chronic respiratory diseases by 2025. These targets are known as the "25x25" goals. This initiative has been led by Ann Gates. Curricula development and resources were developed by: Ann Gates MRPharmS, Member of the World Heart Foundation Emerging Leaders Programme 2014. Dr Brian Johnson, General Practitioner and Honorary Medical Advisor to Public Health, Wales. Dr John H M Brooks, PhD (together with existing Kings College Medical School undergraduate course resources in association with Dr Ann Wylie and Kings Undergraduate Medical Education in the Community). Dr Simon Rosenbaum PhD, Exercise Physiologist and Research Associate University of New South Wales, Australia. Dr Jane Thornton MD PhD, Resident Physician and Clinical Researcher, University of Western Ontario, London, Canada. Mr Ian Ritchie FRCS, President of the Royal College of Surgeons Edinburgh, Consultant Trauma and Orthopaedic Surgeon at Forth Valley Royal Hospital, Scotland. Mr Chris Oliver MD FRCS, Honorary Professor Physical Activity for Health (PAHRC), Edinburgh University and Consultant Trauma Orthopaedic Surgeon, Royal Infirmary of Edinburgh, Scotland. Steffan Griffin, Medical Student at University of Birmingham, Director at Move Eat Treat, United Kingdom. Professor Patrick Callaghan, Professor of Mental Health Nursing and Head of School of Health Sciences, Faculty of Medicine & Health Sciences Nottingham University Medical School, United Kingdom. Mr Jon Dearing, Consultant Orthopaedic surgeon, NHS Kilmarnock, United Kingdom. Ellinor Olander PhD Lecturer in Maternal and Child Health, City University London, UK. Fiona Moffatt PhD MCSP Assistant Professor, University of Nottingham, Division of Physiotherapy and Rehabilitation Sciences. United Kingdom. Alan Taylor MSc MCSP Assistant Professor, University of Nottingham, Division of Physiotherapy and Rehabilitation Sciences, United Kingdom. Paul Hendrick PhD MCSP, Lecturer, University of Nottingham, Division of Physiotherapy and Rehabilitation Sciences. United Kingdom. Victoria Hood PhD MCSP, Lecturer, Division of Physiotherapy and Rehabilitation Sciences, University of Nottingham, United Kingdom. Dr Hamish Reid, Academic Clinical Fellow in Sport and Exercise Medicine, British Heart Foundation Centre on Population Approaches for Non-Communicable Disease Prevention, University of Oxford, United Kingdom. Jo Foster, Physical Activity Programme Lead, Macmillan Cancer Support, United Kingdom. Clare Stevinson PhD, Lecturer in Behavioural Aspects of Physical Activity and Health, Loughborough University, United Kingdom. Dr J Varney, Dr M Brannan, Dr Z Williams, R Shaw and H Ridgley: Public Health England. David Lipman BHlthSci(Pod)Hons BAppSci(HMS)Hons, Medical Student at Deakin University, Australia. Dr Paul Remy Jones, Academic Foundation Year 2 Doctor, St. Thomas’ Hospital, London, United Kingdom.